← Healthy Eats For All is One Today! The Super Bowl is just around the corner, and I know that I’m already planning my menu! I’ve had some time to experiment with different recipes thanks to the famous Snowpocalypse of 2015. I am very excited to have been asked by Chobani to create some recipes using Chobani Greek Yogurt for the Super Bowl. 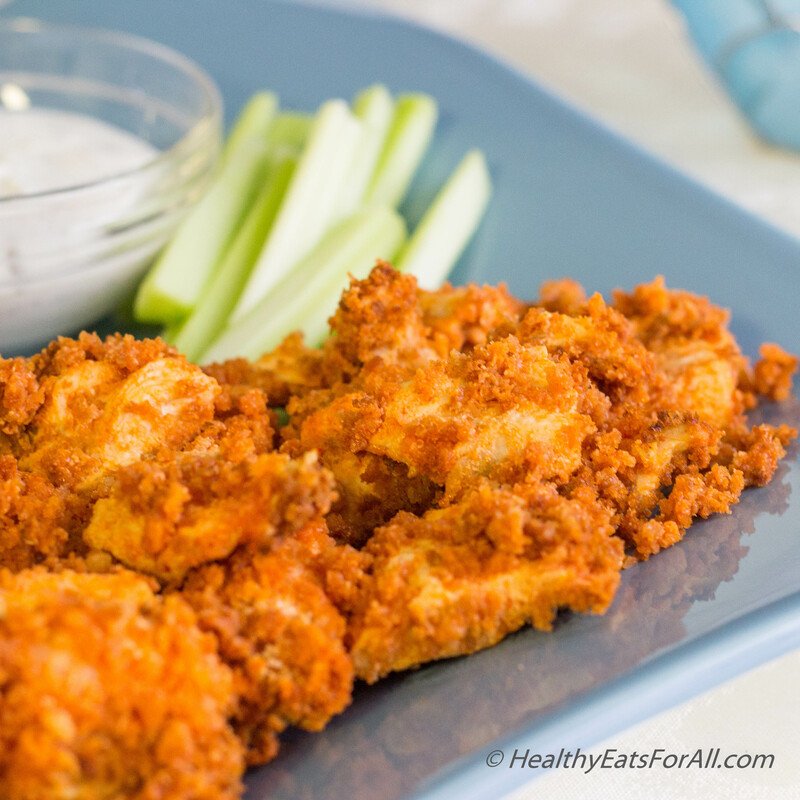 So as part of the #Chobani #deliciousbowl campaign, I’ve created a recipe which is a take on a classic Super Bowl appetizer: Buffalo wings! Including Chobani Greek yogurt was part of my inspiration. 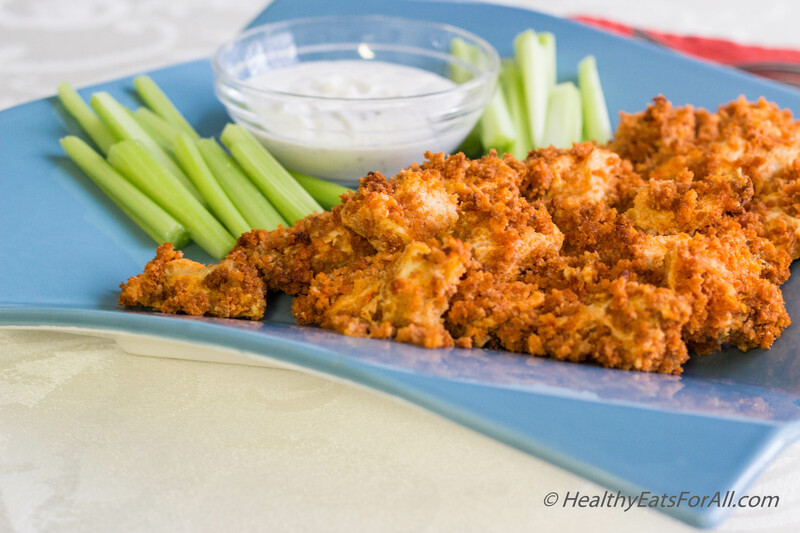 This recipe uses Chobani yogurt as a marinade and includes a baking rather than frying component – effectively replacing most of the fat and calorific excess with protein. I’ve also made them in bite form, making them perfect to snack on during those nail-biting game moments! Organic Boneless Chicken Breasts – 1 lb. Chobani Non-Fat Plain Greek Yogurt – 1 small container or 5.3 oz. Cut the chicken into 2” pieces. To make the marinade add the Chobani yogurt, ¼ cup buffalo sauce, salt and red chillies in a bowl and mix well. Add the chicken, coat well and leave for ½ hour. Meanwhile heat up the oven to 500 F.
Add the panko crumbs to a tray, drizzle the olive oil on it, and mix well. Bake the crumbs for 5-7 minutes till turn slightly brown. Take them out in a shallow dish. Now take the marinated chicken and coat with panko crumbs by dipping a few pieces at a time. 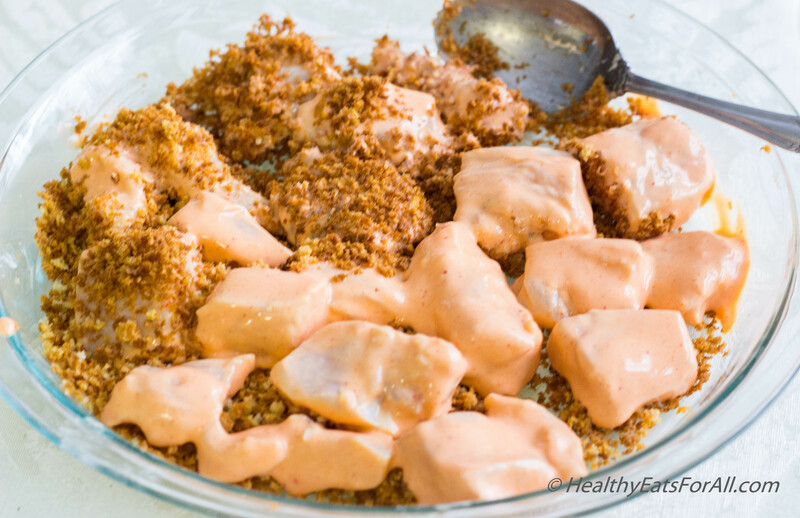 Place a cooling rack on a shallow oven tray, place panko coated chicken on the rack and bake in oven for about 7-8 minutes, then take out and flip and bake another 7-8 minutes or till no juices come out (you can test by slicing 1 piece). 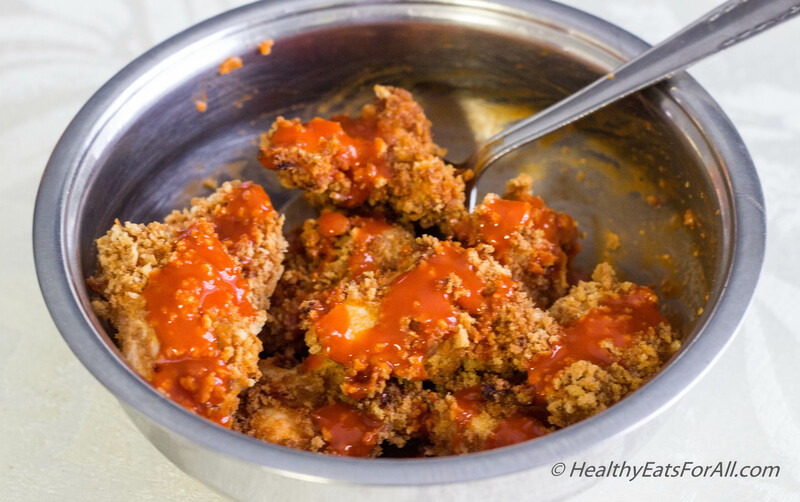 Pour the rest ¼ cup Buffalo sauce (or add more if needed depending upon hot spicy you like the wings) in a separate bowl. This last step should be done right before eating so wings still have some crispiness. The good thing is that you can reheat the chicken in oven if you have prepared the chicken earlier saving you time. Add the cooked chicken in this ¼ cup of sauce and gently stir so all pieces are coated with the sauce. 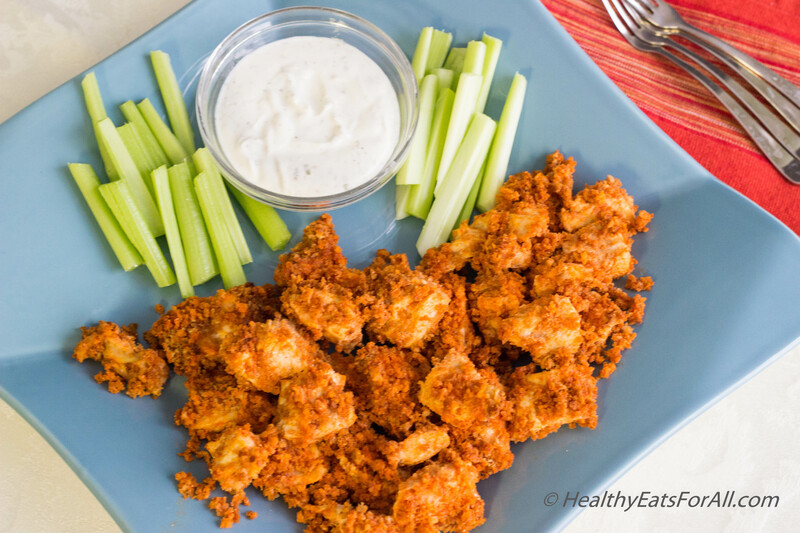 Enjoy with some healthy Homemade Ranch Dressing made with Chobani Greek yogurt! 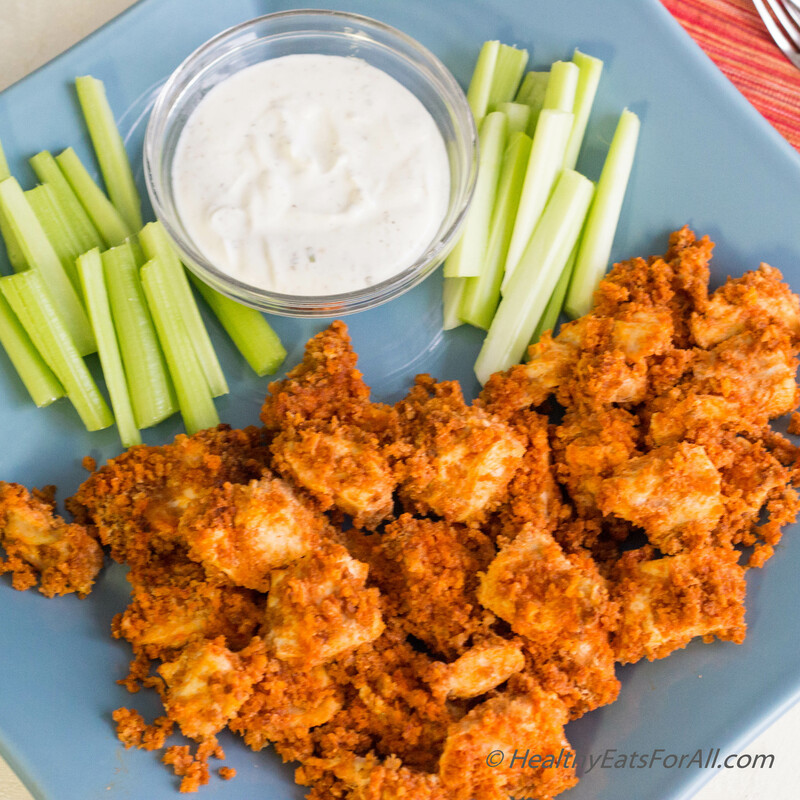 These wings can be added to some Romaine lettuce and tomatoes also to make a great Buffalo Chicken Caesar Salad! For additional Chobani recipes check out their Tumblr page.